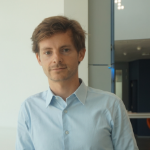 Charles Ruelle is Chief Innovation Officer and Co-head of Euler Hermes Digital Agency, with a double mandate: explore new business models in trade finance and reinvent credit insurance using digital technologies. Previously, he was entrepreneur and he was the first CTO of Etalab, the French Prime Minister's task force for Open Data. Charles built the French open data platform: data.gouv.fr to make easily and freely accessible French data. Charles is also Board Member at Hello Tomorrow Challenge, a international challenge open to science & technology innovators.